El Fushimi Inari-Taisha (伏見稲荷大社) es el principal santuario sintoísta dedicado al espíritu de Inari, y está en Fushimi-ku, es un distrito de Kioto, Japón. El santuario se encuentra situado en la base de una montaña también conocida como ¨Inari¨. Inari es el dios del arroz y por consiguiente el patrón de los comerciantes, ya que en la antigüedad se asociaba tener una buena cosecha de arroz con tener prosperidad en los negocios.Hay miles de torii (una estructura que normarmente marca la entrada a un santuario) a lo largo de un camino de cuatro kilómetros, un camino muy famoso que es visitado por muchas persomas. Lo bueno de este santuario es que siempre está abierto y entrar es totalmente gratis. El Fushimi – Inari está perfectamente comunicado con Kioto, ya que está a cinco minutos andando desde la estación de Fushimi inari de Keihan, y a tres minutos de la estación inari de la línea JR de Nara. We visited Fukakusa to see Fushimi-inari shrine. It is very famous shrine, so people visited to there from around the world. People visit to see many Torii. Torii separates gods and humans. Torii looks like shrine gate made of wood, the color is bright red. 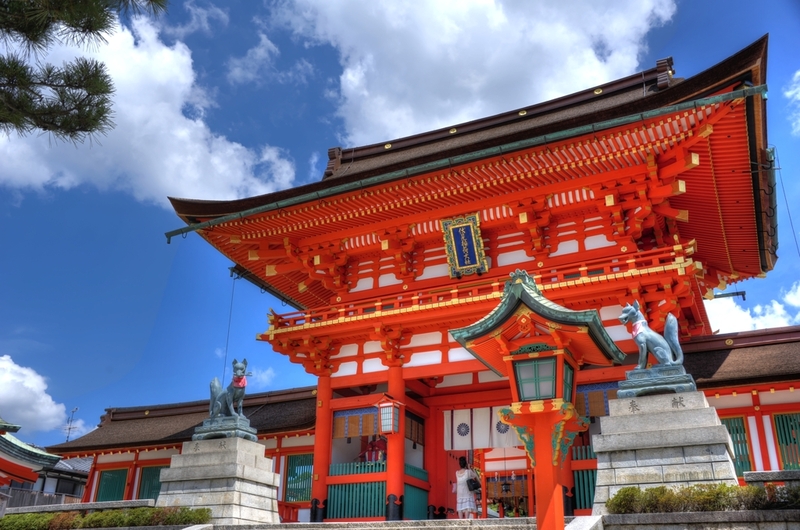 Fushimi-inari shrine is the main shrine of all the inari shrines in Japan. Other Famous place is Fuji-no-mori shrine, it has to with Japanese emperor Tenno. This shrine is famous Ajisai festival and the god is known for having luck in games, so people visit this shrine. When we visited this shrine, we saw may beautiful Ajisai. Ajisai is one of the flower in summer. Next place was main the temple for this trip. This temple is Gonjo-ji temple. Gonjo-ji temple is has to with our report. The place we visited is called Fukakusa. It is called Fukakusa because a long time ago, a person named Shosho-Fukakusa lived there. He loved Onono Komachi. She was most beautiful woman in Japan in Heian period. He loved her, but she didn’t love him, so she got an idea. The idea was very simple, he met her every night for 100 days. Her house and his house were far away. The distance was about 7 km, but he would like her to be his wife, so he met her every night. First day, second day, 97th day 98th day 99th day, he met her with peanuts. On the 100th night, she waited for him. However, didn’t come. That day he died because of heavy snow. The next day she found out that he died. She was very sad, so she was planted his nuts in her village. Later the nut grew and the tree is believed to be 1,000 years old. Gonjo-ji temple is a very important place. This is where Fukakusa lived. There is a pond and this pond is where he looked at himself. There is a big Buddha in this temple, and Fukakusa and Komachi are buried here. Her house was in Yamashina. Yamashina is a town on the border of Kyoto and Shiga, so her house and his house were far away. However when she heard that he died, she was very sad. Therefore when she died, she was buried in this temple. Gekkeikan (月桂冠) is one of the most famous brands of sake, or rice wine, in Japan. The Gekkeikan brand is the result of a very long history; the Gekkeikan company has been brewing sake for more than 370 years in the southern part of Kyoto in area known as Fushimi. Fushimi is an ideal place for sake brewing because of its natural environment. Appropriate temperatures and good-quality water are required to brew sake. In Fushimi, both of these important factors exist. The city of Kyoto is set in a basin, surrounded by mountains on the north, east and west. These mountains keep Kyoto very chilly in wintertime. A cool temperature of around 5℃ is important to mature sake in a brewery. So cold winter temperatures created by Kyoto’s natural basin is why sake brewing became so deeply rooted here. Also, especially in Fushimi, there is a lot of high-quality groundwater that has been there since ancient times. One day in the Heian period (794-1185), rare and fragrant spring water started flowing out at a shrine in Fushimi. It was christened “Gokougu” (御香宮, see Photo 1. ),by the Imperial Court. This water was soft and full of rich minerals. Sake made from this groundwater felt really smooth on the tongue. Sake used to be matured in huge wooden barrels (see Photo 2). Unfortunately, these are no longer used and sake fermentation is controlled by computers now. However, today it is still possible to see the casks and a traditional brewery, which was built in 1906, at the Gekkeikan Okura Kinenkan(月桂冠大倉記念館),which is where the Gekkeikan Memorial Hall is located. This brewery is named Gekkeikan Sake Kobo(月桂冠酒香房, see Photo 3). Here, we are able to see the process of sake– making throughout the year. At this brewery, 40 kiloliters of sake are brewed per year even now. The traditional way of making sake is so complicated, however I will explain in a simple and concise way now. → The grade of sake often depends upon the percentage of polished rice that is used. The rice grain husks are removed to make polished rice. →The rice is steamed for around one hour. → Steamed rice, koji (rice mixed with the micro-organism aspergillus oryze), yeast, and water are put into barrels (see photo 2) and the mixture is allowed to ferment for 20~30 days. Koji helps turn the rice starch into sugar content; yeast helps to turn the sugar content into alcohol. → Moromi is put in a bag and squeezed by a big press. From this process sake gains a smooth texture. → The sake is then is fermented for one year or more. More than 50 kinds of sake are sold by Gekkeikan. Each of them tastes a little different. It is fun of to try many different kinds in order to find your favorite one. Below are two kinds of sake and one plum wine made by Gekkeikan. It is possible to sample these at the Gekkeikan Okura Kinenkan(月桂冠大倉記念館). Daiginjo means top-quality sake brewed at low temperatures from rice grains milled to 50 percent of weight or less. It is a really fresh and fruity taste. It is better to drink it well chilled. Ginjo means high-quality sake brewed at low temperatures from rice grains milled to 60 percent of weight or less. This is a good, full-bodied sake. The label and shape of the light blue bottle in this picture is a retro design. This wine, or umeshu in Japanese, has a delicate taste and flavor of plum. Many plum wines are served as an apertif. It is open from 9:30-4:30PM. And it is closed over New Year holidays and the O-Bon Festival in mid-August. Admission: Adults (¥300); Children ,aged 12-17 (¥100); Children, aged 0-11 (free). Please make reservations in advance for group visits. Daigo-ji is a very famous and important temple of the Shingon sect of Buddhism in Fushimi-ku, to the southeast of Kyoto City. It was made a world heritage site by UNESCO, due to its wealth of national treasures and its historic importance. This temple was founded in 874 by a Buddhist monk named Shobo, who, upon his death became known as Rigen Daishi (Great Master of Holy Treasures.) Shobo worshipped a local god here at Kamidaigo Mountain, and the simple hermitage he constructed was later to grow into the complex of temples known as Daigo-ji. This expansion came through the patronage of the imperial family, and notably the Emperor Daigo, who in 930 entered the priesthood after sickness forced him to abdicate. A very pious man, he was buried in the temple grounds just a few hours after he entered the temple as a monk, having taken the name Hokongo. Subsequent emperors, Suzaku and Murakami, also supported the development and expansion of the complex, with most of the main buildings being built in the 10th century. The temple complex at Daigo-ji is spread out over two levels. The Kami Daigo is the upper level, and the Shimo Daigo the lower level. The five-storey pagoda here is a national treasure, and the oldest surviving building in Kyoto Prefecture, being built in the year 951. Kondo, the main hall at Daigo-ji, was originally built in 904, but arsonists set fire to it, resulting in its destruction in 1295. The present building was actually relocated from Mangan-ji, another temple in Wakayama Prefecture, and reconstructed on this site. One other great attraction at this temple, along with Sanbo-in, is the exquisite small temple building Benten-do, which sits serenely above the pond here, casting a majestic reflection on the still waters. Along with many other temples in Kyoto, Daigo-ji was heavily damaged during the Onin War period between 1467 and 1477. However, much later, Toyotomi Hideyoshi pledged tremendous financial support, as well as personal involvement, in restoring Daigo-ji to its former greatness. Built in 1115 by Shokaku, Sanbo-in is located in the central part of the Daigo-ji complex, and is the place where generations of Buddhist monks have traditionally resided. In Sanbo-in, the architectural detail is generally arranged for a specific purpose. A very good example is the main drawing room, Omoteshoin, which overlooks the whole garden. The design and aspects of this room are typical of the style of the Momoyama and Heian periods, when Shinden-zukuri, or mansion style architecture, was first introduced. This Omoteshoin is specified as a national treasure. The garden of Sanbo-in is also the garden that Hideyoshi Toyotomi designed himself for the grand ‘Hanami of Daigo’, a legendary flower viewing party. Kyoto has three major festivals; the Aoi Matsuri, the Gion Matsuri, and the Jidai Matsuri. Depictions of the Aoi Matsuri are represented in paintings in this room. Landscapes presenting scenes with good examples of foliage that typify and illustrate the season of fall adorn this room. Images of a bamboo forest with flowers and birds are painted on the sliding doors in this room. The paintings are Momoyama period pieces, and are said to be the work of the Hasegawa group. These are three rare shaped stones in front of the pond here, each offering a different representation or meaning. The left stone expresses ‘rapid flow’, the middle stone ‘still water’, and the right ‘interrupted flow’. Okushinden was built at the beginning of the Edo period. In this room, there is a fine example of ‘Chigaidana’, or staggered shelves, named “Daigodana”. The Daigodana is considered one of the three major works of shelves in the whole country, along with the Kasumitana of the Shugakuin Imperial Villa, and the Katsuratana of the Katsura Imperial Villa. The viewing of flowers is a traditional and time-honored event in Japan, and this temple is particularly famous for its cherry blossoms. So much so, that there is actually a well-known phrase, “Flower Viewing of Daigo” in Japan. In 1598, Hideyoshi Toyotomi held a monumental flower viewing party in this temple, which became known as the largest flower-viewing event in history. He personally designed and landscaped a special garden in the environs of Daigo-ji Temple for this affair, and reformed and rebuilt the temple on a larger scale to include it within Sanbo-in. In spring, many kinds of flowers bloom here, along with the approximately 700 cherry trees that were planted for the hanami spectacular, for example, varieties such as Kawazu-zakura, Shidare-zakura, Someiyoshino, Yama-zakura, Yae-zakura, Obeni-shidare, and Oyama-zakura. It is possible to see the blossoms of these trees from around the last ten days of March to the first ten days of April. It is said that Hideyoshi invited many people to the big event: his legal wife, noblemens’ concubines, 1300 ladies of the house, his son Hideyori, a high ranking feudal lord, Toshiie Maeda, and many more dignitaries. For this major occasion, the women changed clothes at least three times, and eight teahouses were constructed around the site to cater for guests. The women could also take a bath in some of the teahouses, if they so wished. Hideyoshi died five years after this, but he certainly added to his legacy with this party. Today, an event to commemorate this is held on the second Tuesday of April each year. The main attraction is ‘The Grand Procession’ (hotaikou-hanami gyouretsu). Selected people dress up as famous historical figures, like Hideyoshi, etc, and march in this procession. However, you will not see any samurai in armor or with warrior’s helmets. Instead, they wear loud, party type clothing for viewing the flowers and blossoms. If you go along, you can enjoy both the procession and the gorgeous blossoms. It is truly a case of killing two birds with one stone. Access: Take the Tozai Line subway to Daigo Station, and then walk east for 10-15 minutes. Japanese sake tells us much about Japanese history and culture. Kyoto is very famous for sake because Kyoto has very clear water, so there have been many sake companies since ancient times, especially in Fushimi in the south part of Kyoto. Learning about Japanese sake is a good way to know about Japanese food culture. Also recently many people have tried to revive “slow food” in Japan. Japanese dishes are very healthy, and they go with sake very well, and Japanese sake is good for our health too. At first, Japanese sake has a long history in Kyoto. In ancient times in Japan, sake was used for festivals and parties, but chiefly it was for the Japanese gods because sake is recognized as a pure drink. Of course, the people also enjoyed drinking Japanese sake at festivals because they believed that it was the will of the gods to share food and drink with the gods at festivals. Still now, in Kyoto, each festival often has sake, and people enjoy festivals even more by drinking. you will find many barrels of sake because many sake companies offer them as thanks to the gods every year. Recently Japanese sake has experienced a revival in Japan because of its effects on our health, so sake is in the spotlight now. It is said that sake is effective in helping high blood pressure and allergies and as a beauty treatment. Sometimes, people add sake to the bath for their skin because it will help our skin stay moist and warm. Japanese sake is not only for drinking, but also for a healthy life. As I said before, Fushimi is well-known as the place where much good sake is made. There are over 30 sake companies in Fushimi because the water suits the making of sake well. Especially, sake made in Fushimi is appreciated by many people because the taste is sweeter than other sake, so it is easy to drink. This is because the water in Fushimi, considered some of the best water in Japan, contains potassium and calcium. What’s more the traditional way of making sake results in the perfect Japanese sake. Now there are some museums of sake in Fushimi where we can enjoy tasting sake, and we can learn the history of Japanese sake. I am sure that you can have a good time there because you can experience history of sake in the raw. At last, I hope that people from other countries come to know about Japanese sake and love it because Japanese people are proud of sake. I believe that Japanese sake cannot be outdone by any other sake. It will reveal to you the depth of its history and also the history of Kyoto. Please enjoy drinking sake with the nice view in Kyoto.